This entry was posted in Lawsplaining, Legal Aid, Politics and tagged Access to Justice, Courts, Legal Aid, Shamima Begum. Bookmark the permalink. I have often thought that the deepest pit in hell is reserved not – pace Mr Tusk – for those who promoted Brexit without a plan, but intelligent educated journalists who purposely and cynically and with full knowledge of what they are doing whip up ignorant fury amongst the less educated and intelligent. As you so succinctly put, in the context of a liberal democracy, there is literally NO argument against Begum receiving legal aid and it makes me want to cry the way these stories are always portrayed to suggest that the legal aid goes into the egregious person’s pocket. What about the argument that there are thousands of people who, like Begum, were born and bred here, whose ancestors were born and bred here (mine weren’t), but who, unlike Begum have supported, contributed to, and built, society here, who have done no wrong, but can’t afford the luxury of the legal aid THEY have paid for, so why is it they who have to go even further back in the queue for legal aid, and not Begum?! Yours is the same “liberal” legal argument that says that the eight children of the shirking poor shouldn’t have to share bedrooms, leaving the working poor to limit themselves to one child, or two who have to share a bedroom, as they have to pay for the knocked through council semi to accommodate the shirkers, through taxes, and/or loss of benefits?! Yours is the same “liberal” legal argument that says that the four wives of the asylum seeker shouldn’t have to share a house, so the unemployed, perhaps disabled (but not ticking the right boxes) and unemployable, born and bred Muslim citizen, who has worked and paid for his benefits for 40 years, and just as foolishly bought his own house, and married only the one wife, who has also worked and paid tax and National “Insurance” for 40 years, but who isn’t 67 yet, and is forced to carry on working long into what should have been retirement, and earns over the minimum adult wage, so pays tax, should only be “entitled” to six months job seekers allowance, and then have to be supported by his wife, and see his and her taxes and NI spent on four houses and quadruple benefits for someone who has never contributed in any way, never mind by paying into the Treasury tax pot?! Strange how the hearts of the bleedin’ heart “liberals” only bleed for those who have chosen to victimise themselves, never those who have been made victims by society despite their best efforts to be self-reliant and contribute to society. It’s those “intelligent” “educated” “liberals”, often “journalists” in the “liberal” press and broadcasting (and yellow blogosphere! ), teachers and academics, politicians and civil and other public servants, such as right-on police and even fire chiefs, oh, and the legal “profession”, who purposely and cynically, and with full knowledge of what they are doing, whip up understandable fury amongst the less educated and intelligent. And even the more educated, but not indoctrinated, more intelligent. Because not everybody – no matter that they haven’t done anything wrong, or that they have contributed as fully as they can to society – is entitled to equal treatment before the law. That building block, not only of the rule of law, but of our entire democracy, was undermined by the “liberal” elite long ago, and has now crumbled into dust. You don’t, can’t, earn equal treatment, or qualify for it through good behaviour. It only applies universally to favoured victim groups, including real criminals (attack a white pensioner, if you’re caught you get half the sentence you would if you attack a protected species, but if the white pensioner defends himself against the attack, HE is the one prosecuted?!?!!!!). The day we started making exceptions for the people who offended us the most, as opposed to actually harming us, and started to punish them while giving real criminals a free pass, is the day our civilisation crumbled and died. We should recognise that it that that is barbaric, the mark of a country that has badly lost its way. And it being reported that someone is “getting”, “got” or “on” legal aid, or that they were “granted” it, is proof of nothing of the sort! From my reading the Begum case can be summed up succinctly thus: She is a British citizen born and bred. She belongs either in a British psychiatric institution or a British prison. I don’t wish to get into a deeper argument about what she does or does not deserve,but I do regrettably think, that she will have to be allowed back ,and face whatever kind of justice she deserves. One thing puzzles me from today’s newspaper reports,is how come they can instruct the country’s top lawyers on legal aid? But the vast majority of ordinary people DON’T, in principle or in practice, as the blog itself attests, have unimpeded access to any of them. So without such access, laws have become a dead letter, the work done by Parliament has been rendered nugatory (as in the case of Millionaires vs the People where a load of PC Social Worker “Family” Law judges outvoted the sole Constitutional Law judge and spat in the faces of the ordinary – no doubt thick, uneducated and ill-informed knuckledragging – people who voted for Brexit), and the democratic election of Members of Parliament has become a meaningless charade (especially when they fight to overturn the will of the “knuckledragging……”). That is why the courts do not provide a public service any more. Just one for the rich liberals, and their pet PC projects! Which take money that could put food on the tables of the poor, and use it to pay for a “justice” system for people that have never been part of society. Or, worse, have voluntarily abandoned it (after making no contribution to it) and then sought to undermine and destroy it! A “justice” system that most (all?) contributing members of society can’t acces4?! 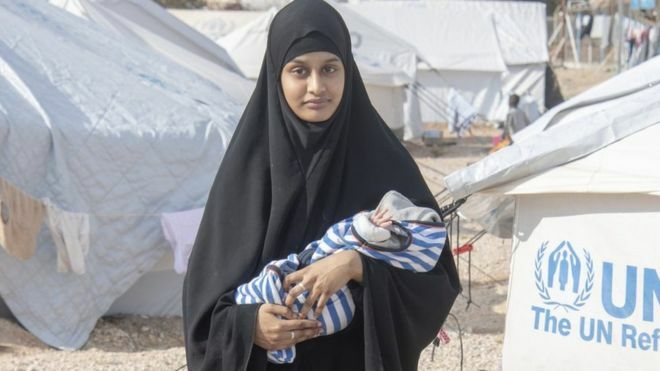 Pingback: Jeremy Corbyn defends Shamima Begum's right to legal aid – Latest News Headlines In Nigeria And Abroad. Spot on as always SB. Ironically here in NZ, we’re facing a couple of similar issues. The first was for an Jihaddi convert who went to Syria, joined ISIS, survived burned his passport and now wants to come home, but somehow has to get himself from Syria to Turkey to the nearest NZ consul. The second is for the mass shooter (alleged so far) at the Christchurch Mosque last month. Spare us the Virtue Signalling Social “Justice” Warrior crocodile tears! Had Syria even granted her a visa, never mind a passport, after fleeing her “home” country to join a terror cult abroad‎?!?! When it suits, ie can be directed at non “liberals” who transgress “liberal” PC rules, all you can hear is “If you can’t do the time: don’t do the crime”, and “you’ve made your bed, now lie on it”! The quickest way to say this is that Begum deserves very little but the British public deserve to have it ensured their government doesn’t turn in to a tyranny, the way of achieving this is ensuring Begum is entitled to legal aid. There is a deserving party but it doesn’t have to be the name on the case.